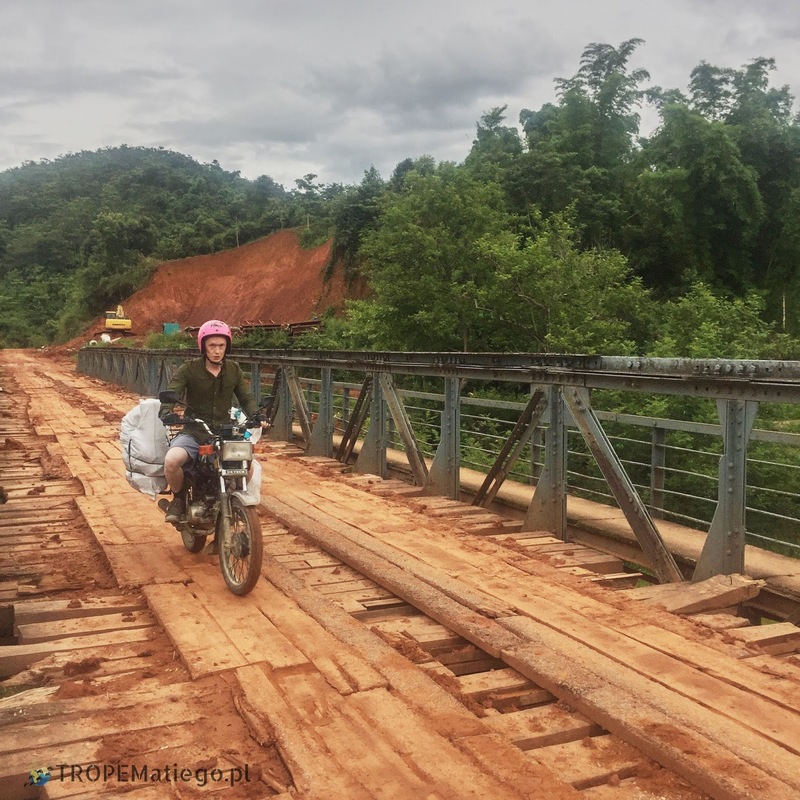 We passed the border, we entered Laos from Vietnam on our Vietnamese motorbike (link). 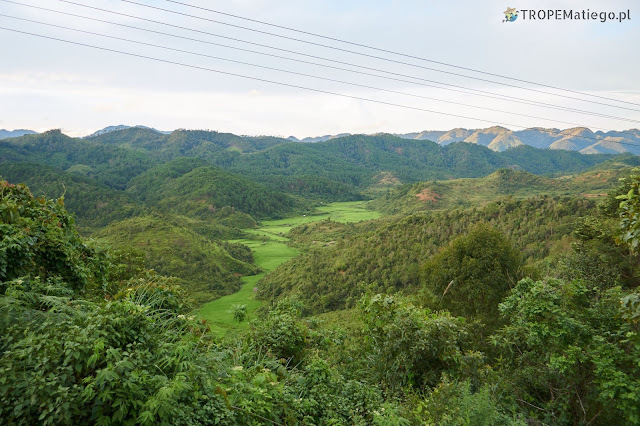 It is the time to start our adventure in mountains on the Laotian roads. The difference in the quality between the roads in Laos and Vietnam is huge. 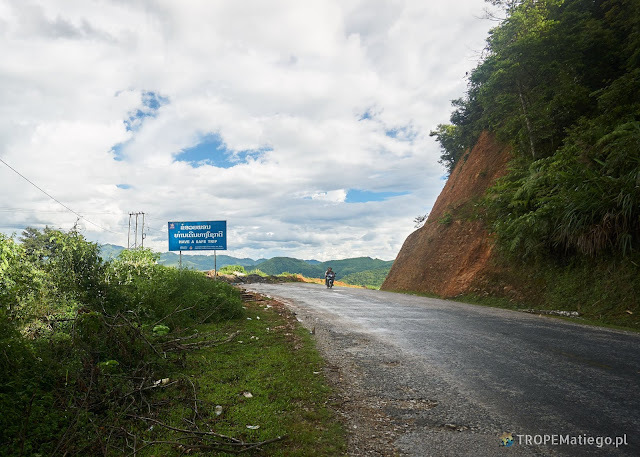 Roads in Laos close to Vietnam sometimes are missing asphalt or the holes are as deep as the size of human calves. An additional attraction is that the roads are very narrow and winding. They are going a few kilometers uphill without any break, then a few kilometers downhill also non-stop. They have several percent drops. The slopes of roads are not protected by any barriers. The mountains in Laos are up to 1500 m above sea level. Another danger is the trucks full of goods. They are driven quite bravely considering the quality of the roads and continuous turns. The quality of the roads took its toll on our motorbike. It wasn’t able to drive uphill on the holey road. Our motorbike had not enough power, so sometimes we had to push it uphill. We were two for one motorbike plus two large backpacks. All this had to be taken by an average motorbike with a capacity of less than 110cc. The constant shaking also caused a damage to the trunk. We had to find a mechanic who would repair it for us. The further from the border we are, the road is getting better. There are fewer holes. Sometimes we pass a big trucks that cannot drive uphill. It is very unpleasant to follow them because they drive slower and you have to inhale their exhaust fumes. We overtake them, but it's quite a risky maneuver considering the precipice you can easily fall into. We spent the night in guest house Saylomyen located on the lake in the city of Viang Xai. One night costs 70,000 LAK (8 USD). Lunch can be ordered for 20-50,000 LAK (2-6 USD). In the menu you may find many seafood dishes. It is charming place, run by Vietnamese. You have to get used to the specific type of service there. When we entered the premises, the employees (who were most likely a family) were eating dinner and watching TV. They were not very interested in us. Finally, a woman came to us, so we could order a room and dinner. Dinner was served by a man with a cigarette in his mouth. We ordered pork noodles. We couldn’t find any pork in this dish. At least there were a lot of the noodles. The dish looked like cooked in a microwave. In the result the food was not tasty. 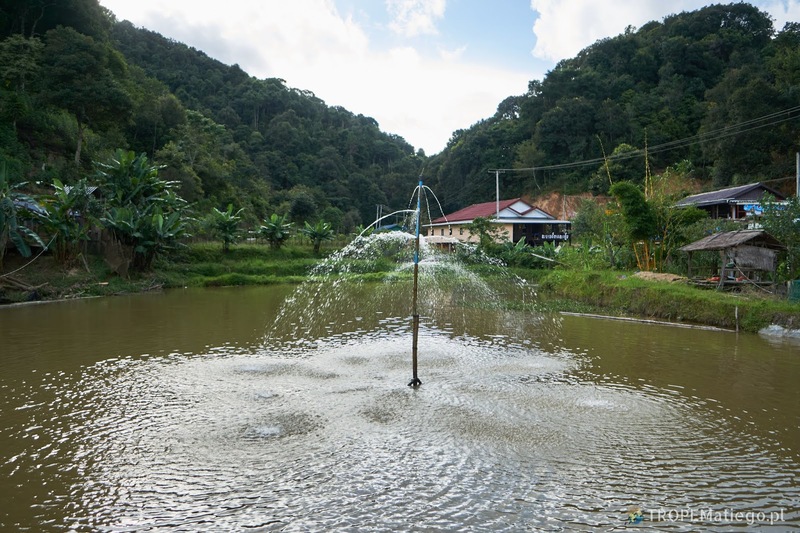 You can also enjoy a Beerlao in this guest house. 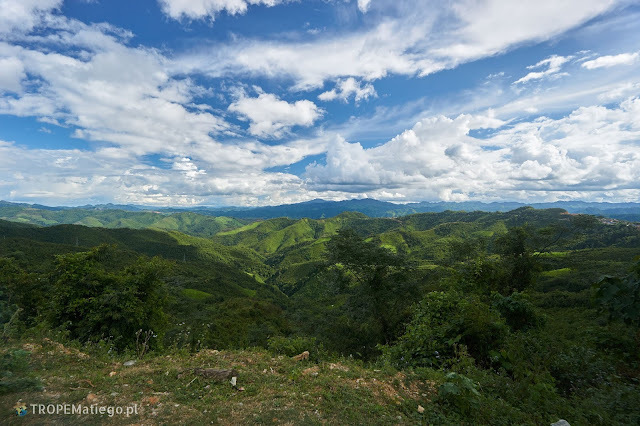 It is worth mentioning that the owner of the Beerlao is the Carlsberg Group together with the Lao government. In the morning we went to look for a mechanic who could weld the trunk. There are several of them in the city, but only one had a welder. He was a young boy, about 17 years old. He repaired our trunk for 10,000 LAK (1 USD). Sample price list in this village: clothes can be purchased for a maximum of 50,000 LAK (6 USD), water 5,000 LAK (0,5 USD), food in a restaurant costs usually about 20,000 LAK (2 USD) per person. 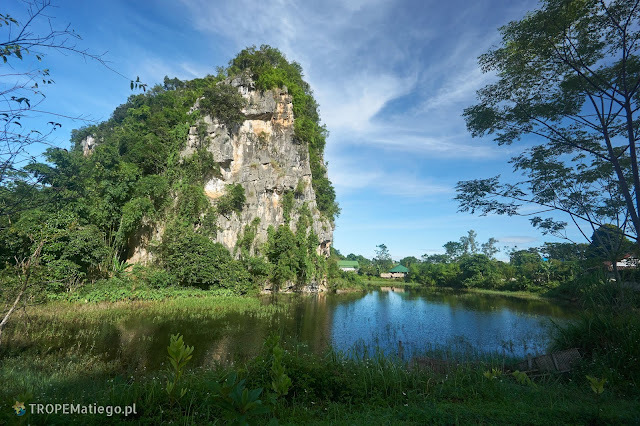 One of the attractions in Viang Xai are limestone caves. 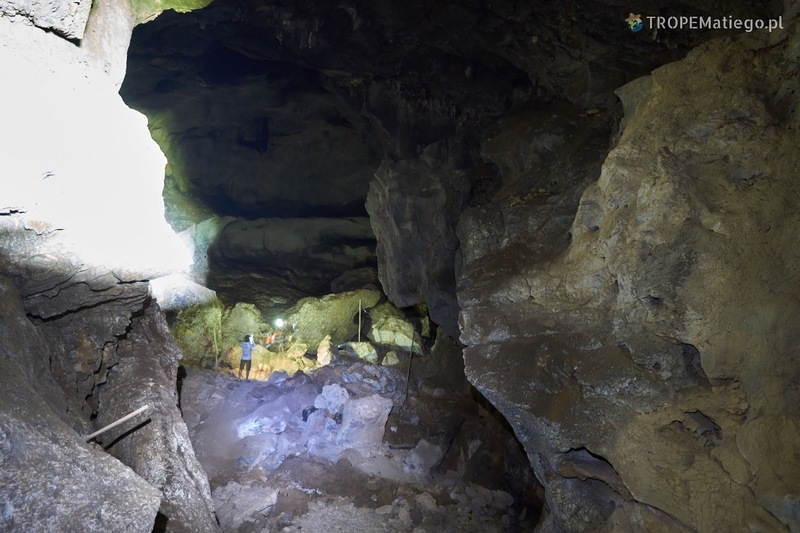 There is about 100 caves in the region. Ten of them have great historical importance. 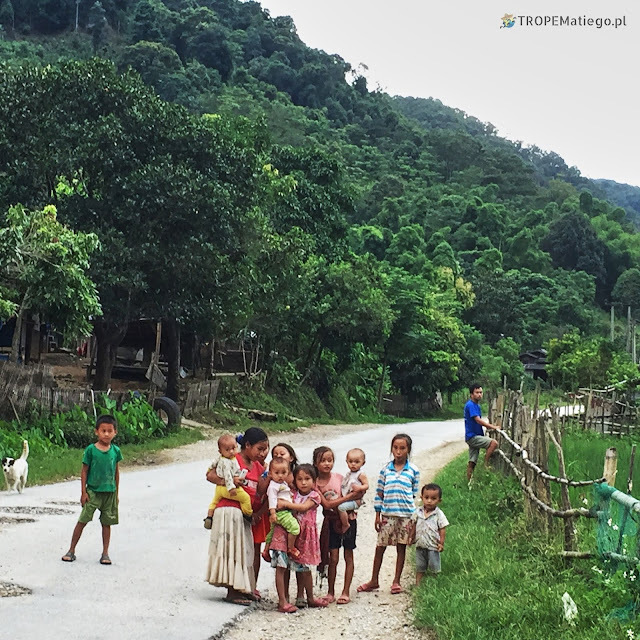 During the Vietnam War, people hided there from intense bombardments for 10 years. These events had a big impact on the future of the entire region. 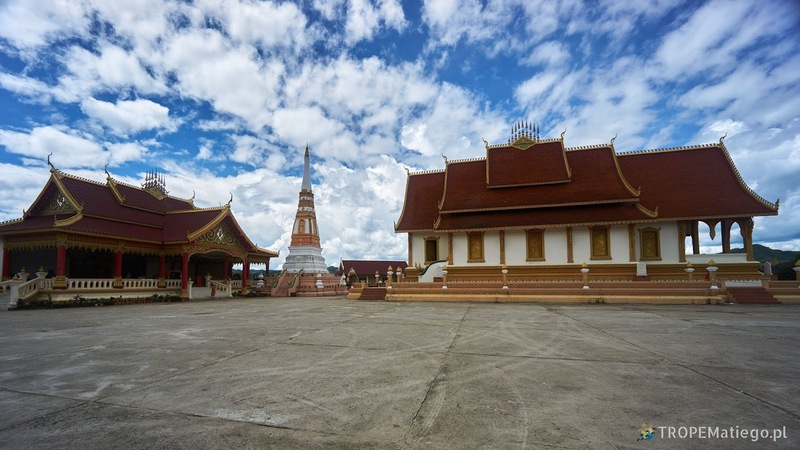 The US assumed that Laos was crucial in preventing the expansion of communism, so this country was involuntarily involved in the conflict between the US and the Northern Vietnam. In 1964, the USA began 10 years of extremely intense bombing Laos country. Many bombs were accidentally dropped to get rid of them after canceling the mission in Vietnam. The Communist Political movement (Pathet Lao) founded the "Hidden City" in the caves. These caves were a shelter for about 20,000 people for 10-year, for almost constant bombing. Their day-to-day life was under the cover of darkness. Schools, hospitals and markets, as well as ministries, a radio station, theater and barracks were hidden in caves. 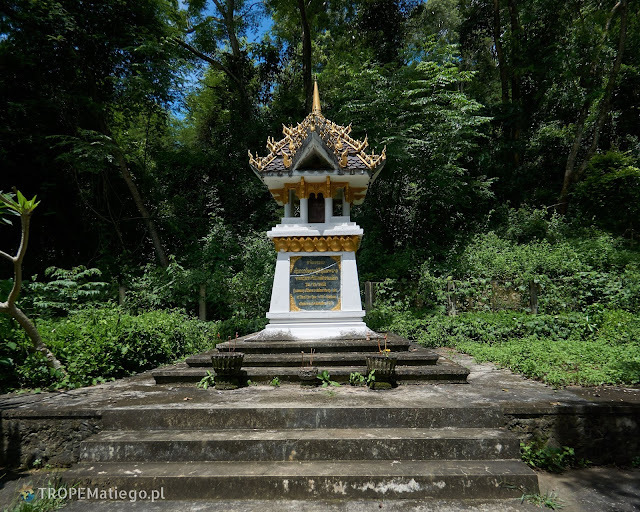 In 1973, the bombing was stopped and the new city of Viang Xai was declared as the capital of the liberated zone. After the announcement of the Lao People's Democratic Republic on December 2, 1975, the capital was moved to Vientiane. 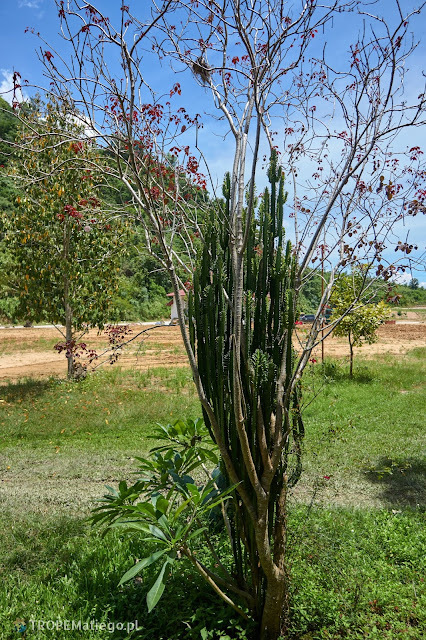 The vegetation impress us, everything everywhere is green. 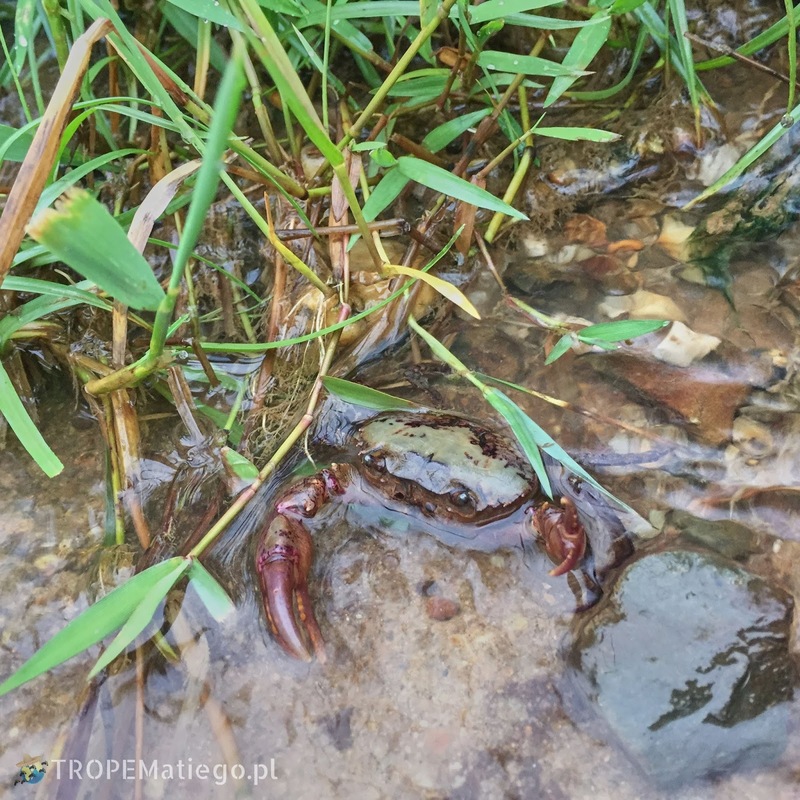 Here is so clean that we found a crayfish in a small river. 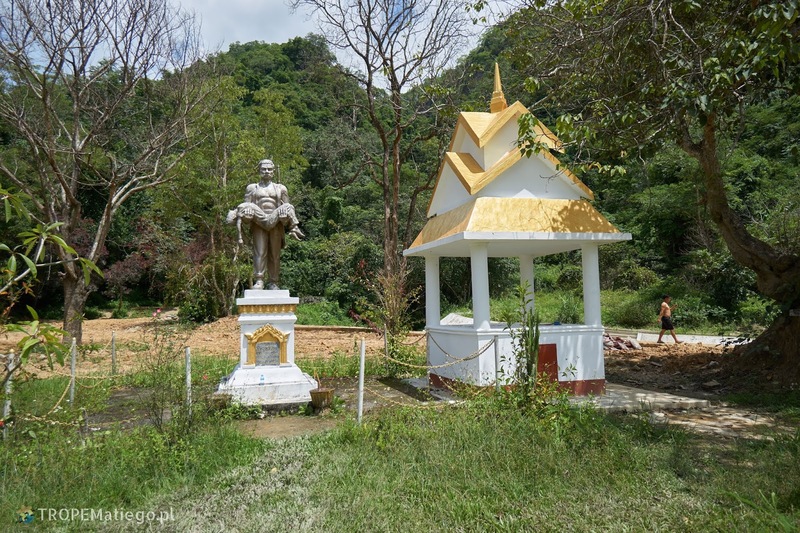 Laos has not yet been contaminated with civilizational "goods." It has also downsides. Well, in many villages there is no electricity. The houses are built by their residents with their own hands. Most of them is made of wood covered by sheet metal. There is already dark at 7 pm so people have to walk with the headlamps. Many houses also do not have water. We could see in several villages that families went to the small river next to the road to make a bath in the late afternoon. Laos welcomed us with rain. The rain turned into a huge thunderstorm in just 5 minutes. Thunderstorms are much more intense than in Poland. Thunders are louder, they can drown out a conversation. Their flashes may brighten the streets at night. 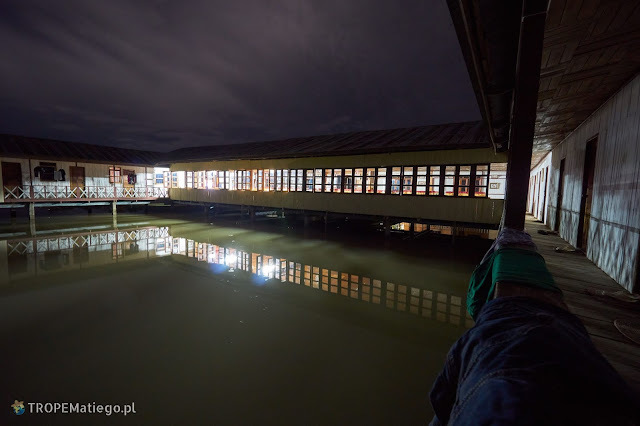 In the wet season, sudden storms in Laos should be expected almost daily. They last about an hour. When you drive a motorbike in Laos you should remember about warm clothes, especially in the morning, when the fogs slowly begin to descend from the mountains. At that time it is quite humid and cold. However, the views in this country are amazing. The forest in Laos’s mountains is everywhere. The mountains bathed in the morning fog look amazing and driving a motorbike on the winding mountain roads in such aura is an experience that cannot be described in a few words. On the way to Muang Kham, we decided to visit temple in the Sam Neua city. There is also a home for small monks. Boys learn to become fully-fledged Buddhist monks in this monastery. We arrived when they were cleaning a side altars. An older boy were their teacher. On the square, next to the temple there is table with chairs. We sat there. A moment later, a shy group of young monks came to us. One of them began a conversation with us. He asked where we are from, where we go. They also gave us a water. Next, he asked if we can have any "money" from Poland. We showed him a two-zloty coin. He asked if he can keep that coin for "a luck". We do not know if this is a normal practice of taking money for "a luck", but it is worth paying attention to such tricks. They also asked for some packages, but we could not understand what it is about, so they abandoned the topic. However, from experience from other place we can guess that it could be the so-called gifts for Buddha or monks. 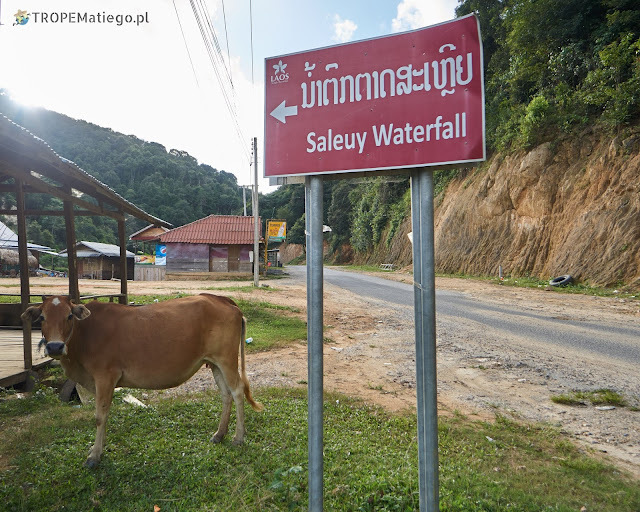 We visited the Saleuy waterfall. You can go up the hill, where there is a nice view. About 2 kilometers to the south-west from the waterfall is a Ban Saleuy village. It is worth visiting. 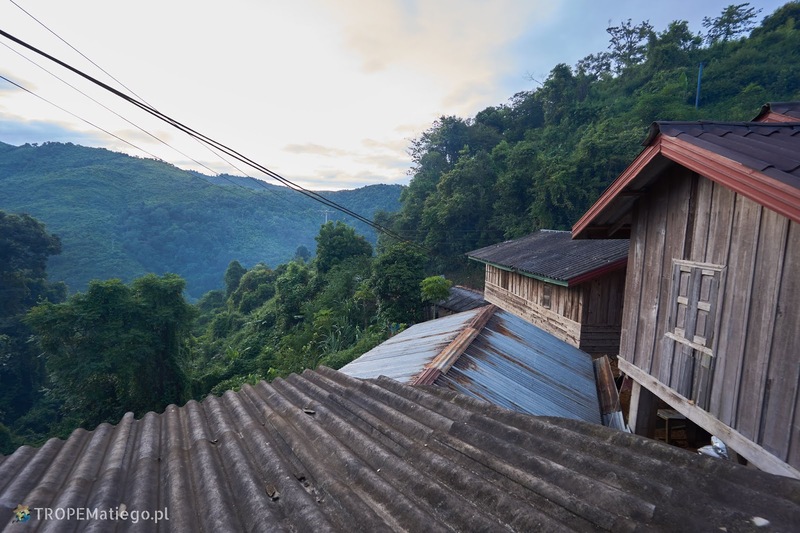 Inhabitants specialize in handicrafts, women produce clothes, bamboo items and they cook delicious local dishes. 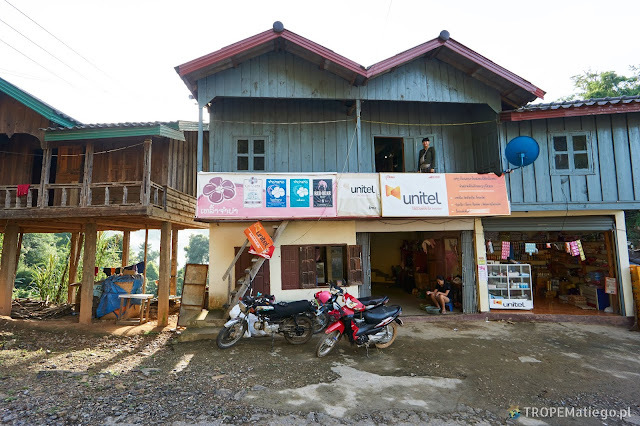 In the village you can also rent a room, so you can see how the local Laotians live. 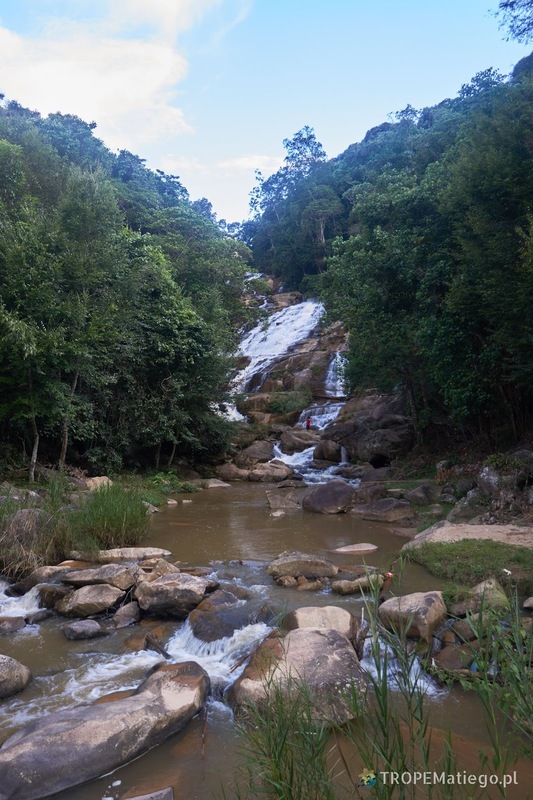 Near the village is also the beautiful Tad Seua and Tad Mou waterfall. You need to rent a local guide to get there. The walk takes about 5 hours (5.3 km). You must start before the noon, the sooner the better. Kohing is a small town at the intersection of three roads. 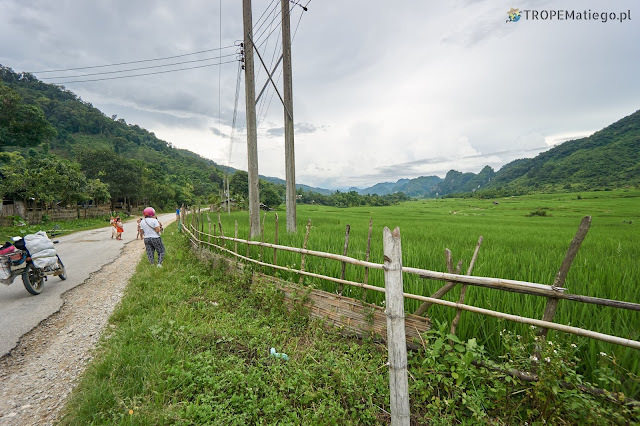 One leads to Sam Neua (where we are going from), the other to Luang prabang and to the Phoukhoun (Xiangkhouang province with the Plain of Jars). 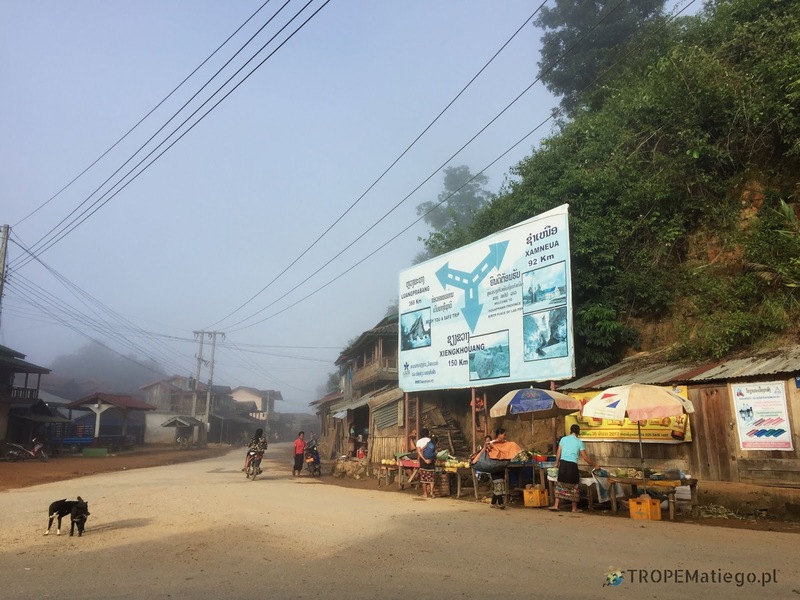 In the morning, at the intersection, residents set up stalls and sell their gastronomic products, plants. We spend the night in a large family house. On the second floor there is a few rooms and a toilet with a hand shower (a large bucket filled with water and a small cup for pouring). The conditions are modest, but the people are very hospitable. They offered breakfast in the morning. 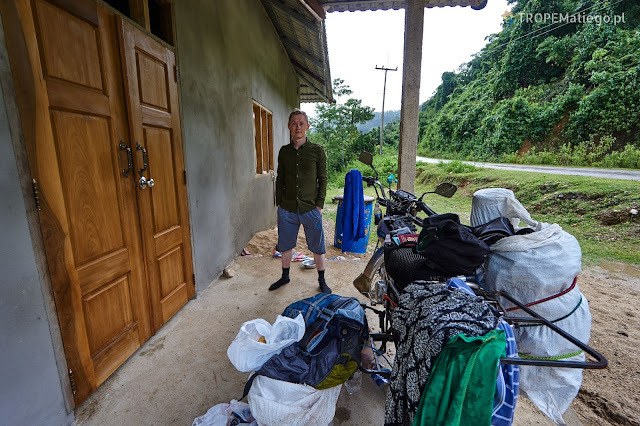 We paid 50,000 LAK (6 USD) per night. 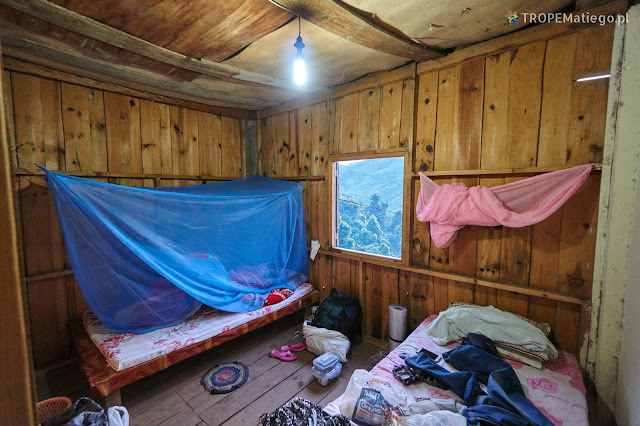 The beds in the room were covered with a mosquito net. When the owners were going to sleep, they made a lot of noise. When everyone were already in bed, some animals started running and making noise. Something stamped and moved quickly around us. The impression was that something was running on the walls in our room, but nothing could be seen, it was too dark. We preferred to not know what this is to have a better sleep. On Sunday we noticed that the number of cows on the road decreased. Practically, there were no trucks, only buses were running. People in the villages worked as usual on Sunday. 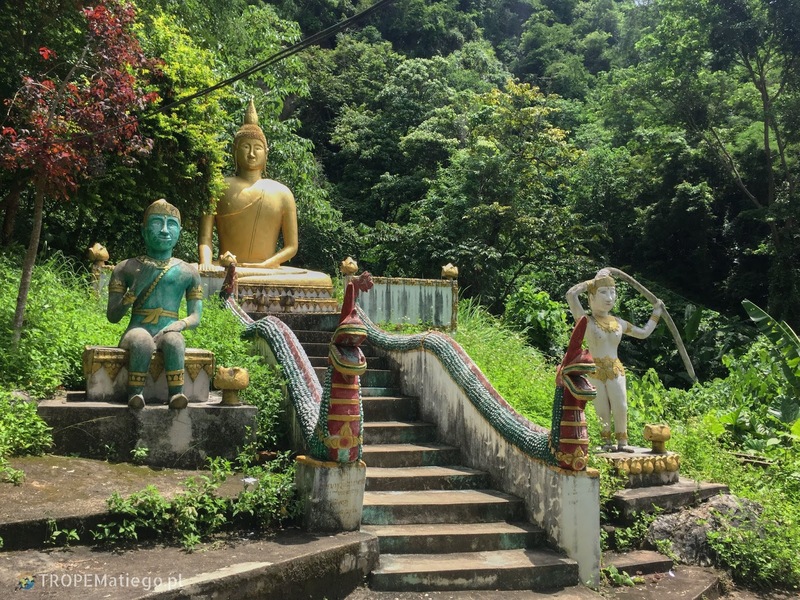 Another attraction in the region is Tham Piew Caves. They are located 6 kilometers before the Muang Kham village, next to the road No. 7. It is worth visiting because they are a reminder of the events that took place during the War in November 1966. People from nearby villages hided in the caves to protected from bombardment. One of the four rockets sent to bombard the caves hit the target and killed 374 people including women and children. At the base of the rocky hill is a monument. It is set there to honor the dead civilian. Walking on the path leading to the cave, we pass a sign indicating that it is the resting place of many people killed in those events. 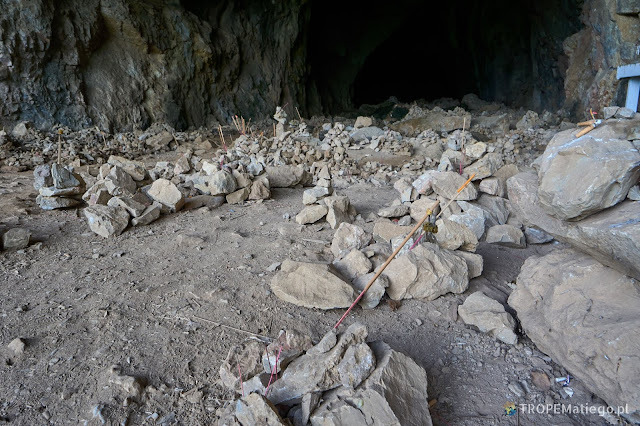 The cave is still blackened from the fire of the explosion. Visitors light incense in memory of the people who died here. The cave is very dark, so you should bring a flashlight. The cave is open daily, the entry cost is 10,000 LAK (1 USD).